We're taking little ones to new heights with our personalized canvas growth charts! A beautiful way to track a child's height while adding color and style to their room, each original growth chart design has been lovingly created by one of Dish and Spoon Productions' talented artists and pairs beautifully with wall art in a coordinating collection. Our growth charts are reproduced on museum-archival canvas using the giclée method of fine art printing. To preserve the integrity of the artwork for years to come, the surface of every canvas growth chart is glazed with a UV protective finish. 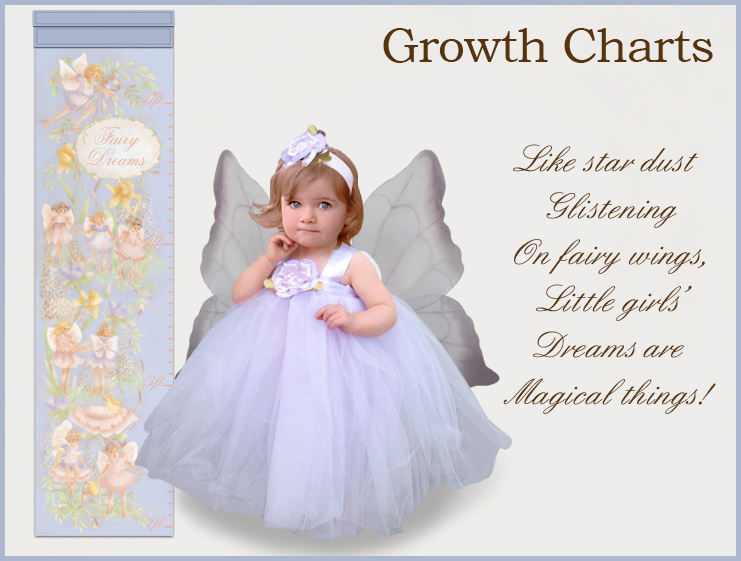 Custom-made upon order and hand-crafted in the USA, each growth chart is individually trimmed by hand to bring to life the intricately detailed edges of the canvas. Many designs are hand-embellished with materials such as Swarovski crystals, Midori satin ribbons, and iridescent opal fairy dust glitter. For the customer who wants a specific decorative look, custom color matching is always an option. Personalization is available on all of our growth charts. Or the canvas may be ordered with a standard text/design. Each growth chart measures 12in. x 45in. and arrives ready to hang from a hand-painted topper made of green-certified wood. Velcro tabs on the back of each growth chart ensure a tight fit to the wall or door. See individual product descriptions for details. Finished products ship within 2 to 3 weeks from receipt of order.